Global Brigades, a nonprofit dedicated to helping resolve global health and economic disparities, held its Northeast Regional Conference at Boston University’s Photonics Center on Sunday. In attendance were approximately 30 student leaders and members of various chapters at BU, Smith College, Harvard University and Northeastern University. GB is composed of multiple chapters that help communities in developing countries. Members of these chapters, which focus on specific fields like medicine, business or public health, take trips to locations like Panama, Honduras, Nicaragua and Ghana to help communities become sustainable and self-sufficient. “This conference is super important because it brings a bunch of chapters together from other universities in the nearby area,” BU Chapter President Shivani Rao said. As told by Senior Volunteer Engagement Associate Nicole Jollimore, GB began as a small group of pre-med students from Marquette University who traveled to Honduras with suitcases full of medicine. The students teamed up with local nonprofit organizations and health professionals to assist the community. “As you can see, we started as a grassroots movement,” Jollimore said. The conference consisted of general lecture periods led by GB board members, various group activities during these lecture periods and multiple breakout sessions in which students split into smaller groups to engage in conversation about GB and its mission. Each breakout session lasted an hour and comprised three themes that groups spent 20 minutes discussing. 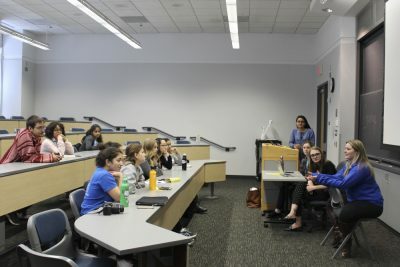 Students from the various participating college chapters shared their struggles with one another and helped each other to strategize and brainstorm possible solutions. Sonika Vatsa, a junior in the College of Arts and Sciences, said she felt the conference went well, and was happy that chapters were able to collaborate and solve shared struggles. Current BU Brigades e-board members acted as discussion facilitators to help push conversation along to matters such as fundraising ideas and proper leadership transition. Conversation was focused on keeping the mission clear and having open communication with new possible recruits to ensure a cohesive environment. The second breakout session focused on emphasizing GB’s mission in a way that sets it apart from that of other organizations. “Finding your WHY” was a commonly referenced theme during the conference, and especially in the second session. BU Brigades Education Chair Maisha Savani said she thinks it is vital to push members to think about why they are a part of GB. “I think it’s important to emphasize why we’re here, why Global Brigades is something we continue to do, [and] why [we] should be doing this [if] this is a fight that a lot of people think can’t be resolved,” Savani said. The second half of the conference focused heavily on GB’s mission to bring sustainability to communities — something that many “voluntourism” agencies don’t work toward. GB Program Coordinator Philomena Panagoulias gave one of the final presentations, in which she described how GB’s mission aligns with the United Nations Sustainable Development Goals. Parihan Ali, Global Business Brigade president at BU, said she attended the conference to bolster the business presence at BU and to see how other chapters could work with the Business Brigades to support them. “A lot of people don’t really understand what it is we do, and how we impact the communities that we go to,” Ali said. Rao closed the conference with final remarks that reinforced GB’s holistic approach to achieving sustainability in developing communities. “[The holistic model] covers the root causes of poverty, and you see a lot of institutions only tackle it from one perspective,” Rao said. Though GB trips are short, Rao said, they have a lasting impact.